Semi-Tubular rivets are inserted in the same basic manner as solid rivets. The way the rivet is formed and its affect on the parts being assembled, however, are quite different. In semi-tubular impact riveting, a compressive axial load is applied to the end of the tubular rivet shank with a specially shaped form tool. This cause the rivet end to flare as it follows the shape of the tool. The rivet end continues to flare and roll until the end has rolled back against the surface of the workpiece. The parts being assembled are (typically) slightly compressed under this load. Most of the joint strength is compressive between the rivet head and rivet clinch (formed end). 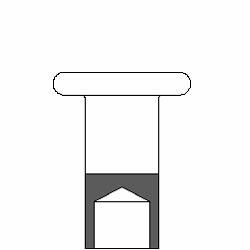 Rivet shank expansion, like that required for successful solid impact riveting, is minimal. Rivet insertion force is typically less than 40% of that required for a solid rivet of the same shank diameter & material.